The past couple of weeks have been challenging, to put it mildly. After too many mishaps, spills, and catastrophes I finally took a moment to do something a bit different. I have been sewing for years but would never consider myself a seamstress, in any sense of the word. I have made all the valances and drapes for our home, most of the kids Halloween costumes throughout the years, and a few other projects, but still, my skills are limited. Even though my sewing abilities are limited, it doesn’t stop me from trying. 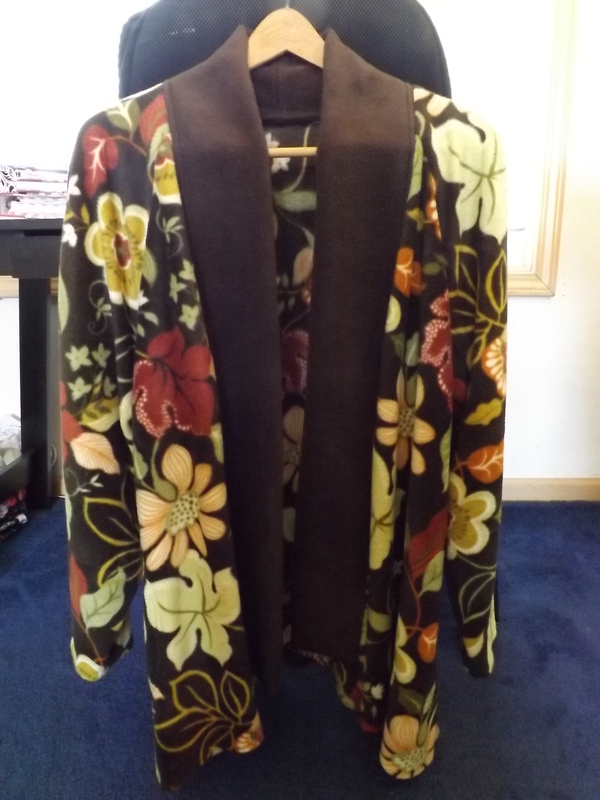 This morning I spent three hours working on a fall swing coat. I bought a pattern for the coat last winter after Christmas with the intension of making seasonal/holiday swing coats. Until now this plan just sat in the back of my mind, waiting for the right moment. Today was the right moment. When I went shopping for the fall/Halloween fabric the stores were already sold out of all the fleece. I found this particular fleece and thought it would definitely be appropriate for fall. I cut the pieces out a few days ago and sewed it this morning. It isn’t perfect. Nothing I ever make is, but I think it looks pretty good. What would I do differently for the next one — I think I might line it. I love to line things because it always gives it a more finished look. At least a homemade finished look. Taking a breather from everything that just doesn’t seem to be working out for me felt good this morning and so does the wonderfully soft fleece drapped over my shoulders right now, and for this I am — Simply Grateful. There are so many things that scream “FALL” when I hear them, see them, smell them, or taste them, and one of my absolute favorites is pumpkin bread. Last week one of our local grocery stores had pie pumpkins on sale and I picked up 6 to can and bake with. After canning 7 quarts of pumpkin, I used the remaining couple of quarts in several of my favorite recipes — the first being Pumpkin-Cranberry Bread with Crumble Topping. Preheat oven to 350 degrees. Grease and flour 2 9×5 inch loaf pans. In mixing bowl, combine flour, pumpkin pie spice, baking powder and salt. Set aside. Combine eggs, sugar, pumpkin and oil in mixing bowl. Beat until just blended. Stir the wet mixture into the dry until batter is moistened. Fold in cranberries. Spoon batter into pans. Combine topping ingredients in small bowl. Cut with pastry cutter until crumbly. Sprinkle on top of batter in pans. Bake in oven 50 – 60 minutes. 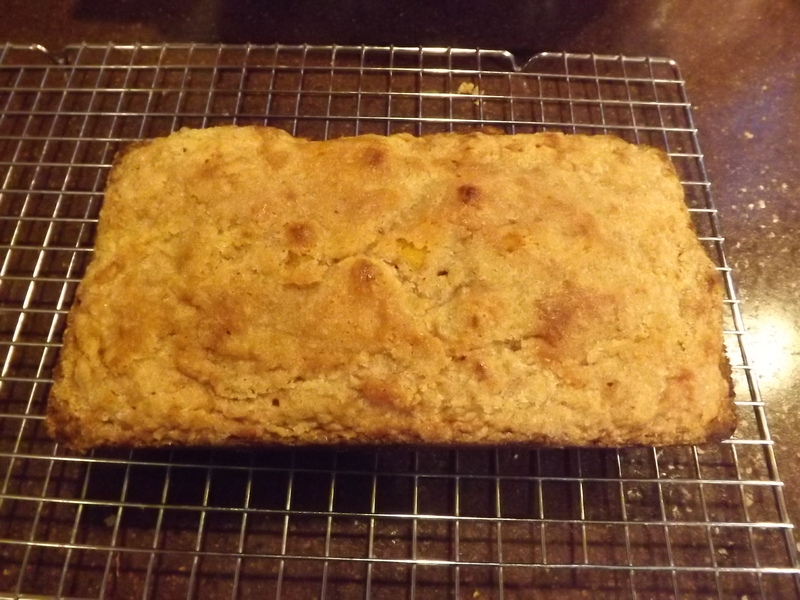 This recipe makes two loaves which is great for sharing. Unfortunately, one of these bread didn’t even make it the day with Hubby and Grace around. We’ve already had to break open the second bread and aren’t even on day 2. Fall is a wonderful time of year, especially with pumpkin, apple, and pear season in full swing, and for this I am — Simply Grateful. It has been a busy couple of weeks and time just seems to escape me. For some reason, finding time when I’m not thoroughly exhausted, to write a blog post is getting harder as the fall weather takes a firm hold of Michigan. 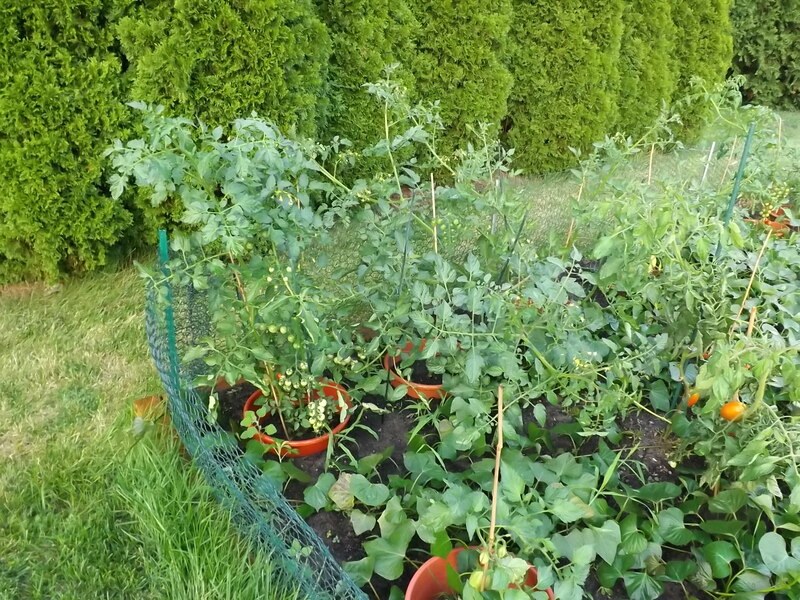 The garden is lush and green, but without the sun and long hot days, I’m not sure the hundreds of tomatoes on the plants will ever see red. I’m hopeful, but realistic enough to have a back-up plan. 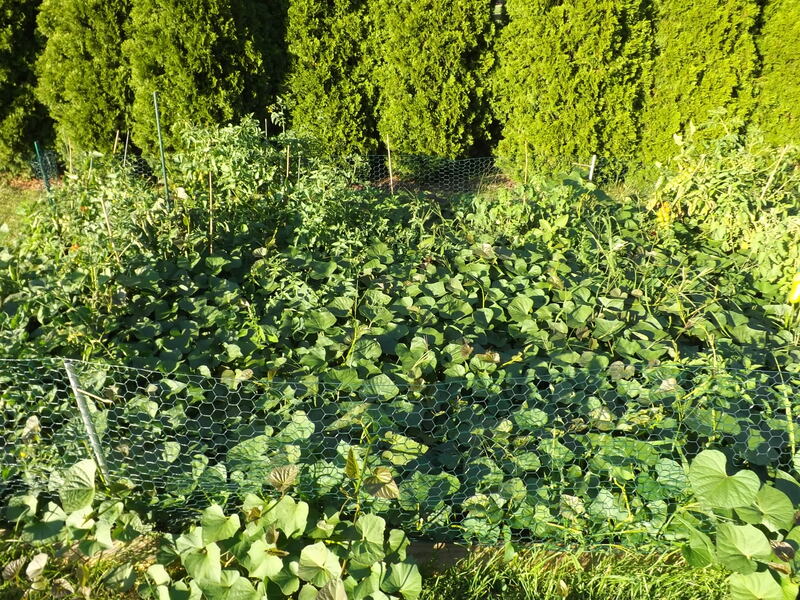 The sweet potatoes are still spreading like wildfire, but I’m not going to begin harvesting those until October or later. 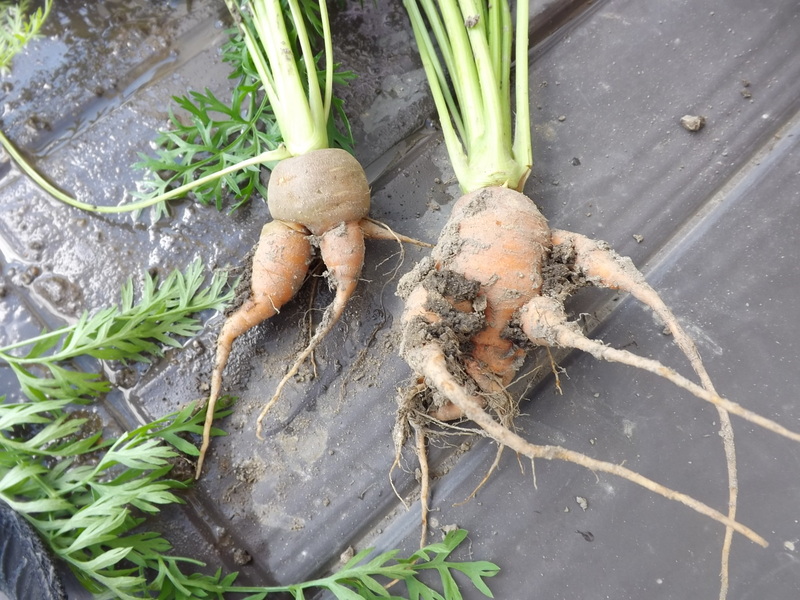 The last of the beets are going to be pulled and canned tomorrow, but today I pulled out some carrots. I’d left quite a few in the ground after harvesting some baby ones earlier in the summer. I couldn’t believe what I pulled out. And that’s just a few of what I pulled. 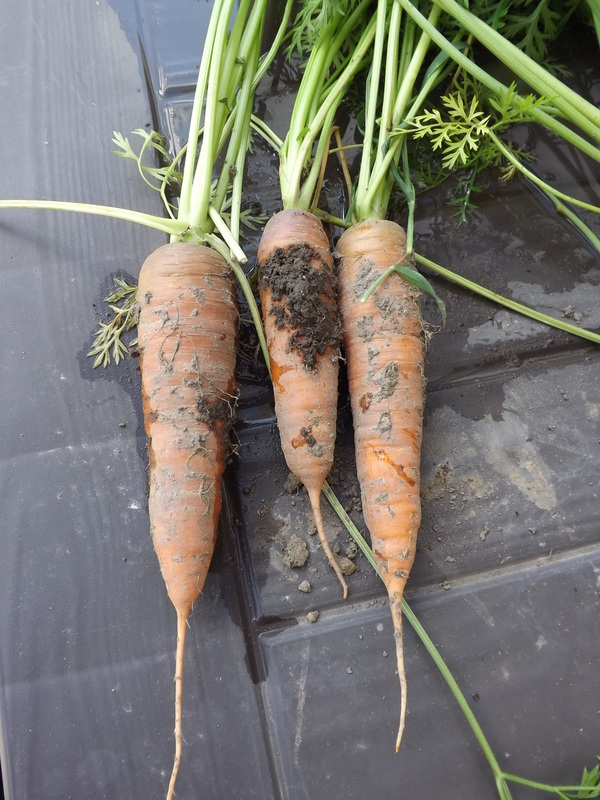 What was really interesting though, were the wonderful carrot creatures I unearthed. Wouldn’t these make great monsters for Halloween? Well, they aren’t going to last that long. Already I used a bunch of them today in a Tomato Alphabet Soup. Surprisingly this soups base tastes a lot like Speghetti-O’s — go figure. That’s okay. It was reminiscent of my childhood without all the additives and preservatives. A perfect accompaniment for dinner on a beautiful Michigan fall day. Saute’ onion in butter until tender. Add tomatoes, carrot, and chicken broth and bring to boil. 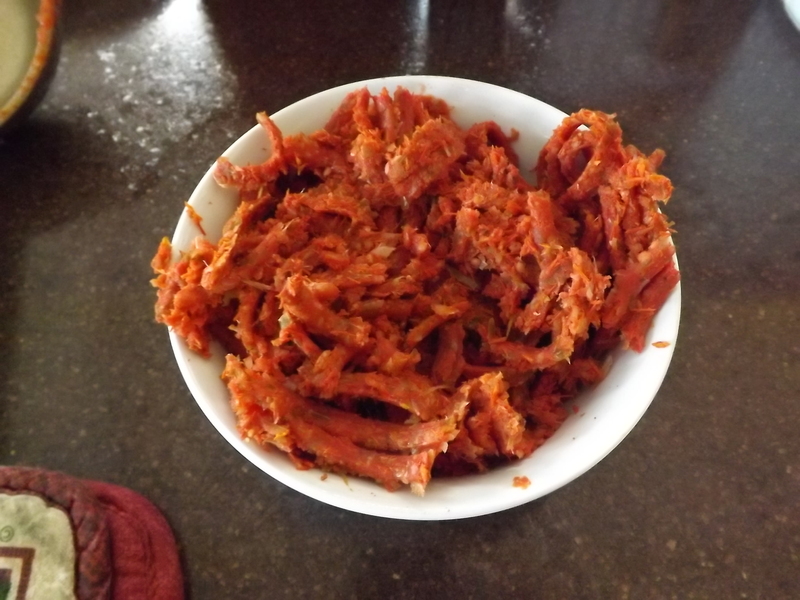 Add remaining ingredients and simmer for 45 minutes until carrots are very tender. Using a stick blender, puree soup. Strain soup through thin screened strainer and return broth to pot. Bring back to boil and add 1 cup of alphabet pasta. Cook until pasta is tender. A quick and easy tomato soup to warm you up on those cool Fall evenings. 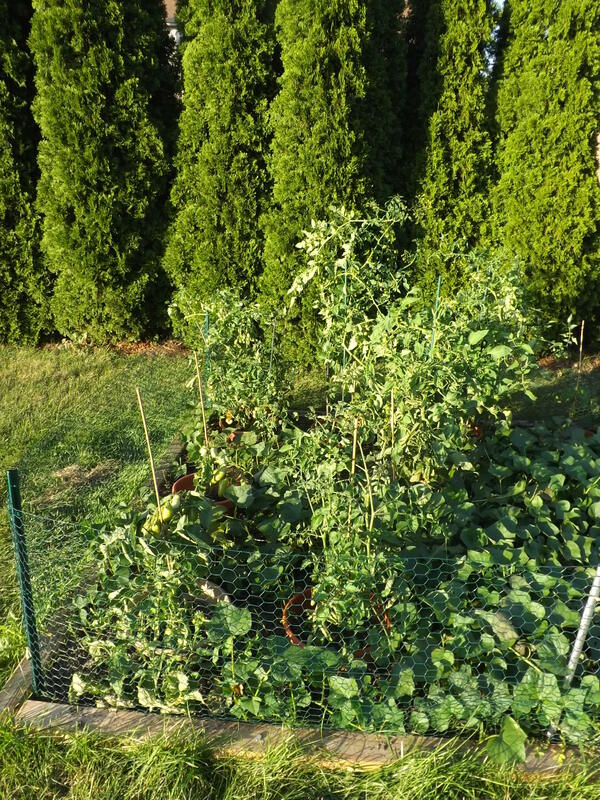 Fall has hit here hard and fast and although I might have liked the heat and sun a bit longer to harvest more tomatoes, I love the change and am enjoying the cool temperatures, and for this I am — Simply Grateful. It’s pumpkin time! With fall comes pumpkins and with pumpkins comes pumpkin pie, pumpkin bread, pumpkin spice latte, pumpkin cookies, and pumpkin seeds. 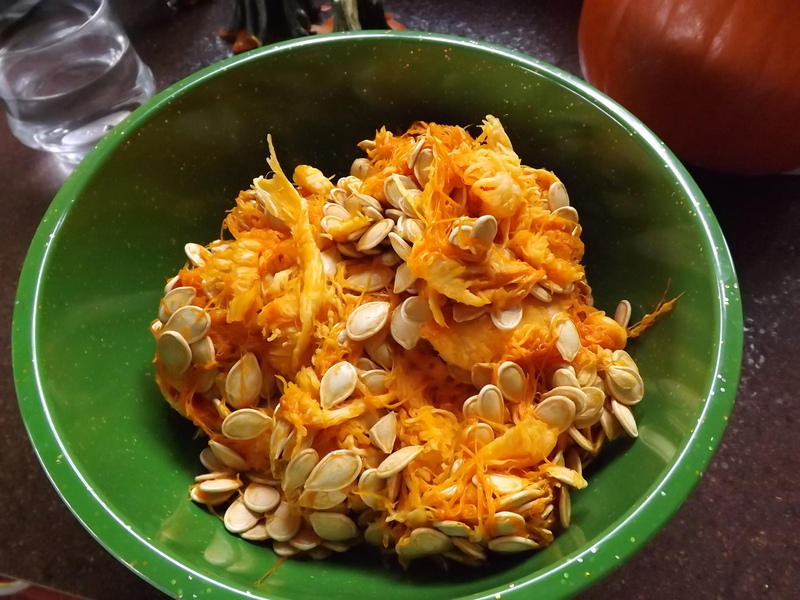 No matter what I use a fresh pumpkin for, I am always sure to make good use of all the wonderful seeds inside. The only trouble is cleaning them. 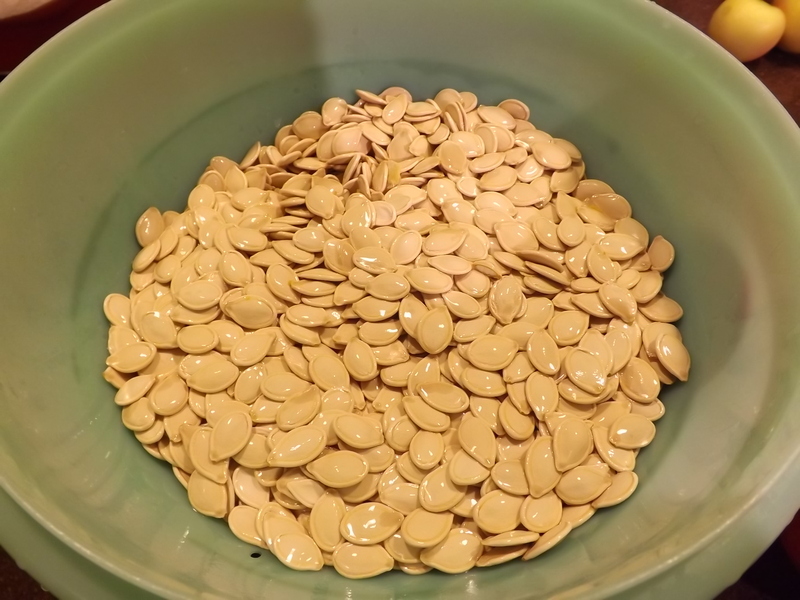 For years I’d struggle to separate the seeds from the guts and get frustrated because no matter how hard I tried, there would still be strings of pumpkin on my seeds when I baked them. Not any more! I learned this little trick through an act of frustration. 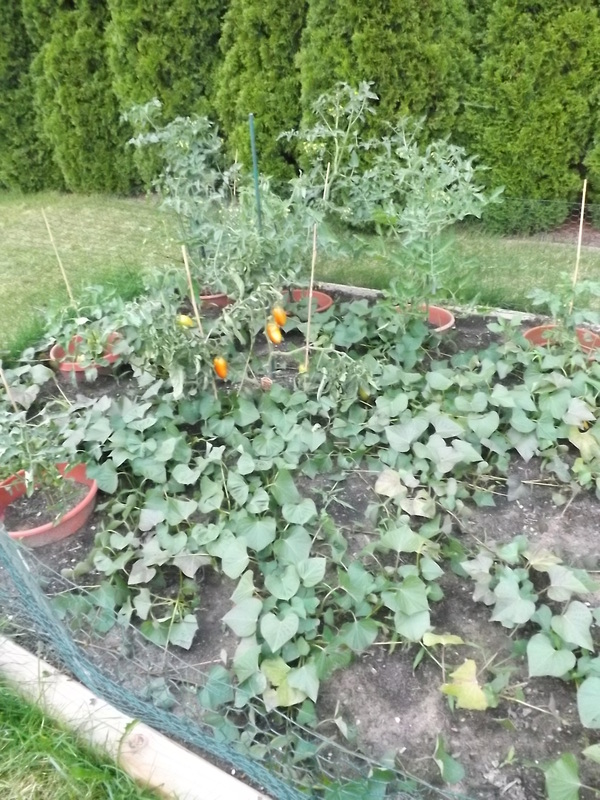 A couple of years ago I was too tired to clean the seeds as soon as I pulled them out of the pumpkin, so I put them in a bowl of water until I found enough energy to work on them. When I came back about 30 minutes later, all the strings and tiny pieces of pumpkin had sunk to the bottom while all the seeds were floating on top. What a time saver! Step 1: Remove seeds from pumpkin. 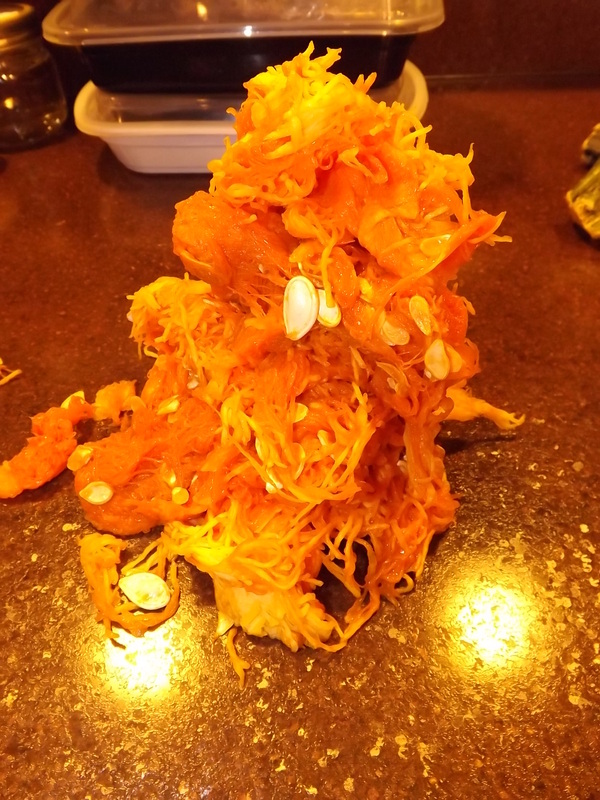 Step 2: Remove the larger pieces of pumpkin pulp from the seeds. 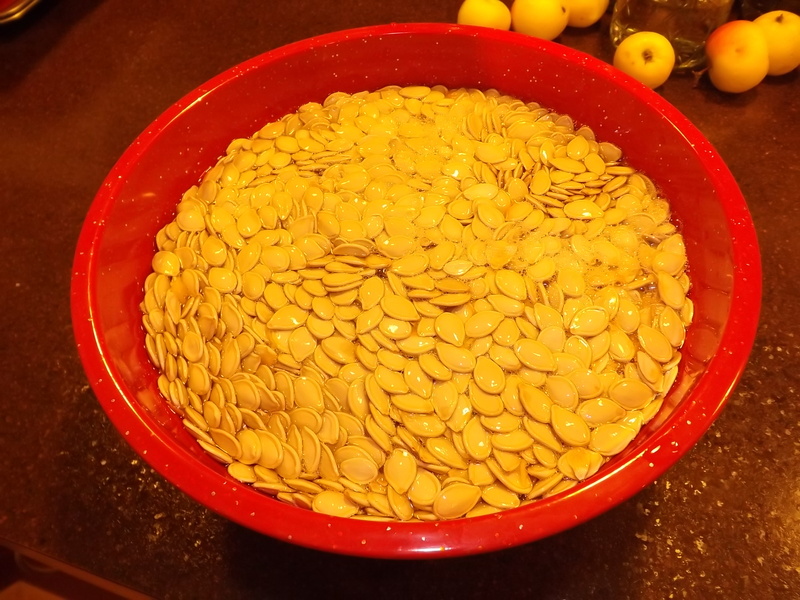 Step 3: Place pumpkin seeds in a bowl twice as large as you need and fill with enough water so the pumpkin seeds can float to top. Step 4: Allow seeds to sit for 5 – 10 minutes, stirring every few minutes. Then, carefully remove clean pumpkin seeds floating on top of water. That’s it! 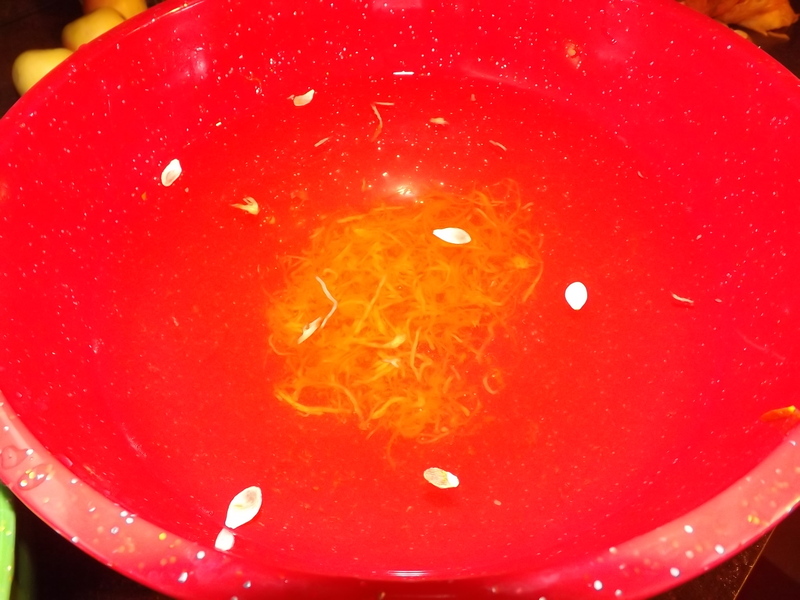 This is what the water looks like with the remaining pumpkin pulp sitting on the bottom of the bowl. 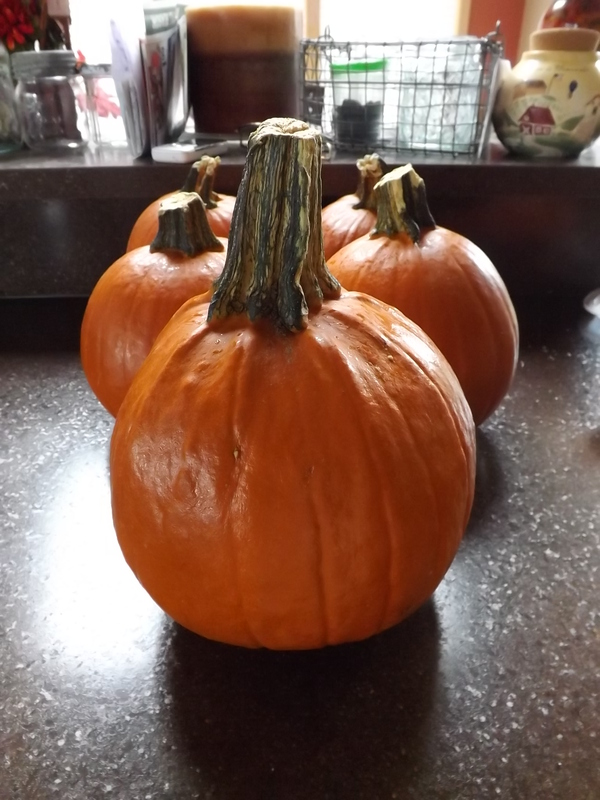 I love working with pumpkins and using the pulp as well as the seeds. Finding a trick that cuts down the time I have to spend in the kitchen makes it even better, and for this I am — Simply Grateful. 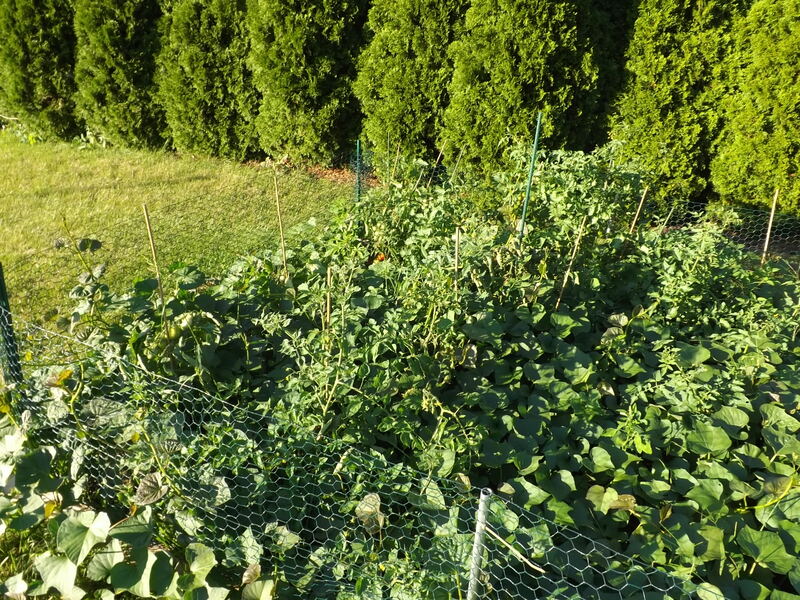 Then we had a heat wave and I didn’t work in the garden other than to harvest. I can’t take the heat and especially can’t take the humidity. 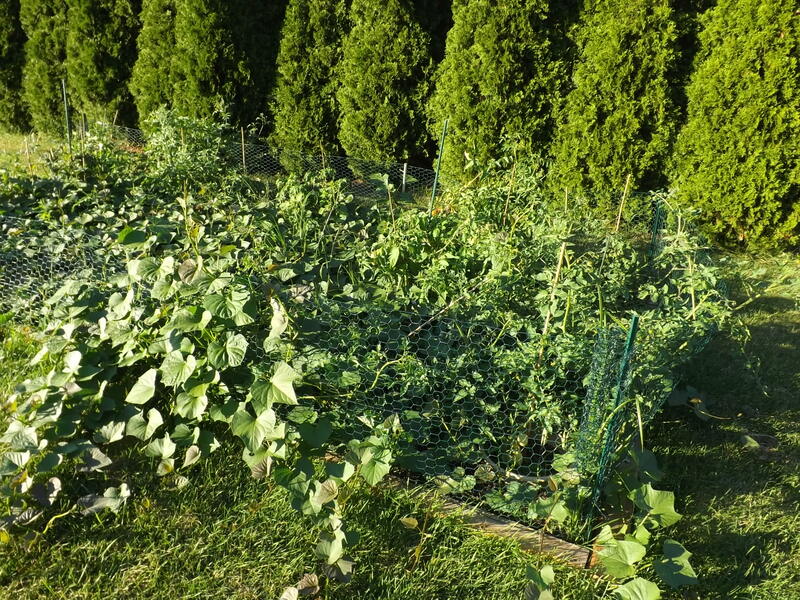 The tomatoes grew to a point of bending or breaking their bamboo stakes and then the sweet potatoes grew right over them, nearly smothering them. 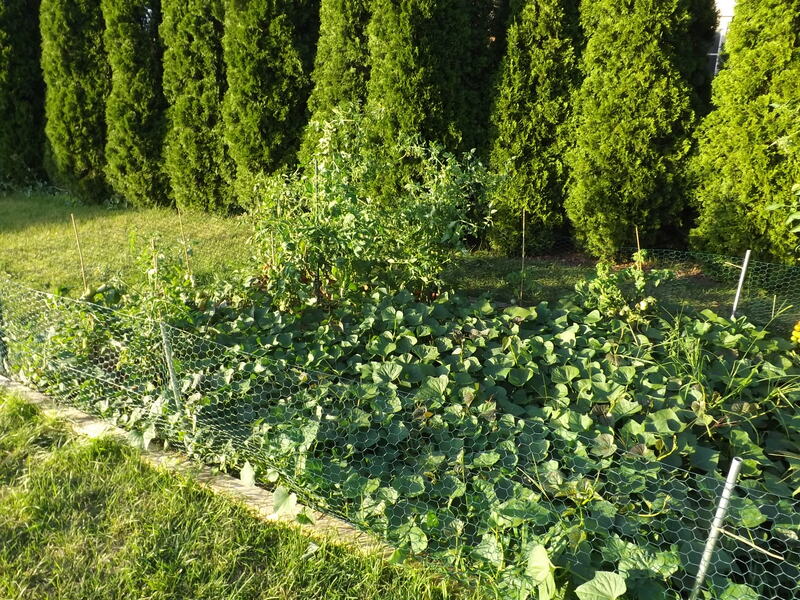 Note to self: Don’t plant sweet potatoes around tomato plants for 2015 — they need their own garden, and a big one at that! 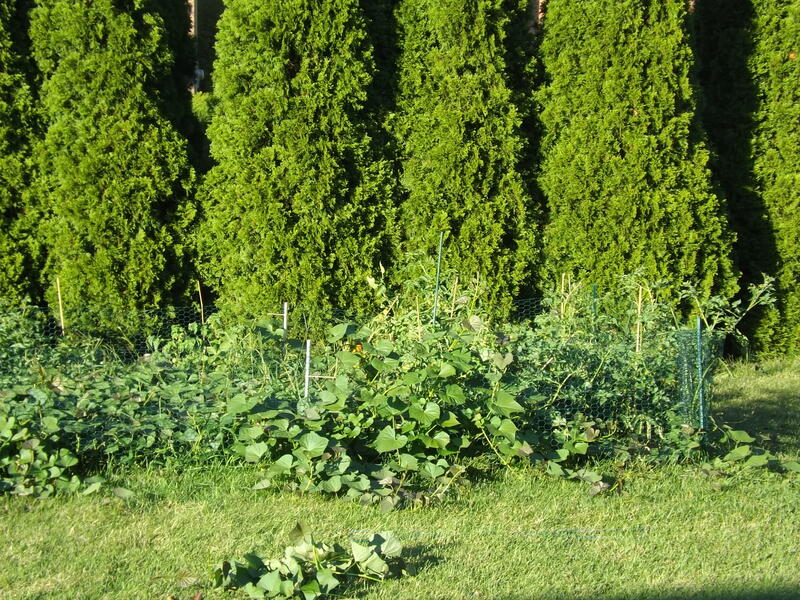 Seeing as the tomatoes were practically buried under the sweet potato vines, I had to do something. 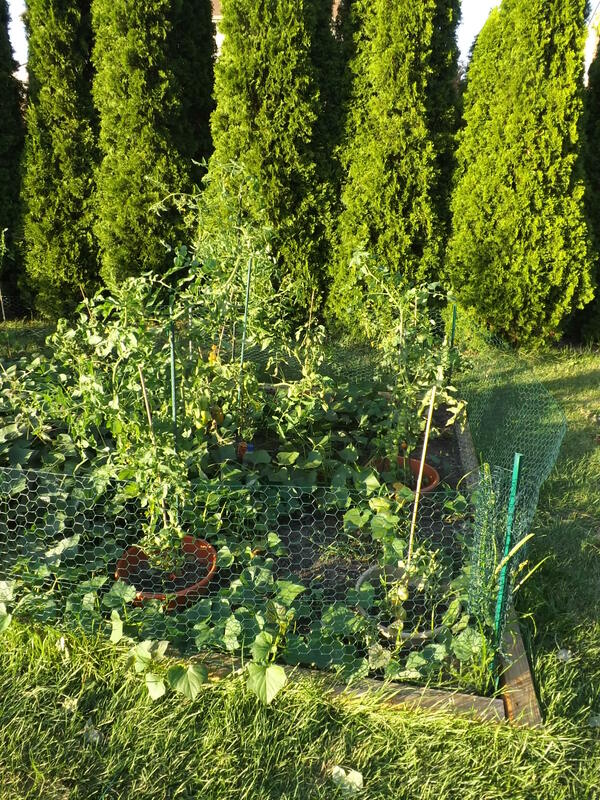 I spent a couple of hours trimming the sweet potato vines and pruning and re-staking the tomato plants. 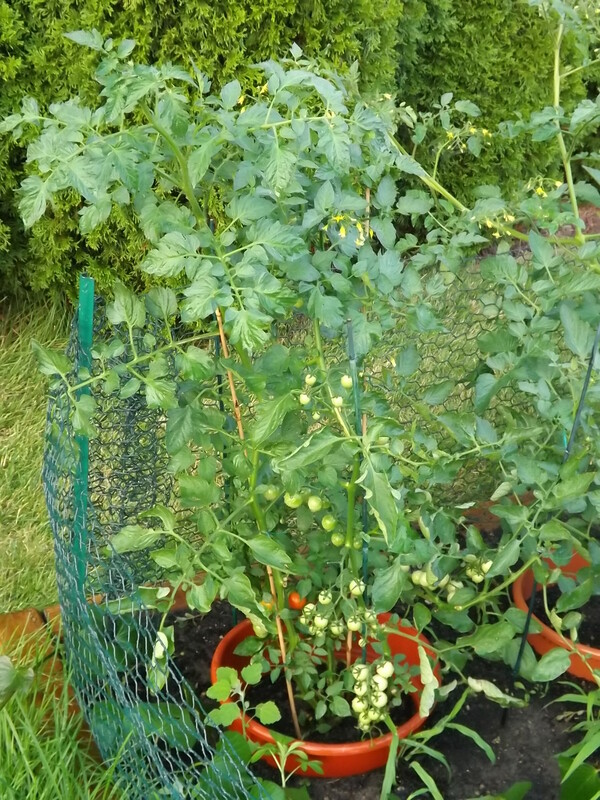 The tomato plants were so overgrown that I had to use shepherds hooks that Hubby cut down for me to hold the over flowing vines. 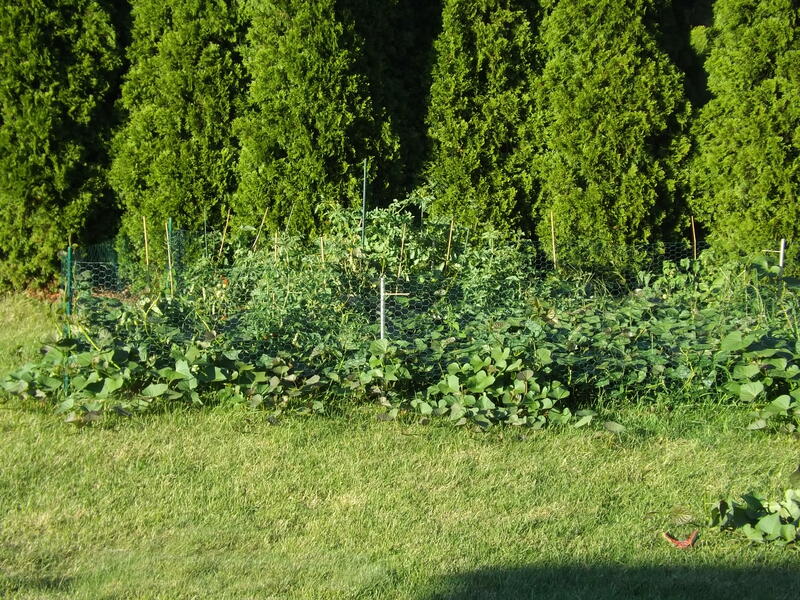 There were some plants that were more than five-feet tall. 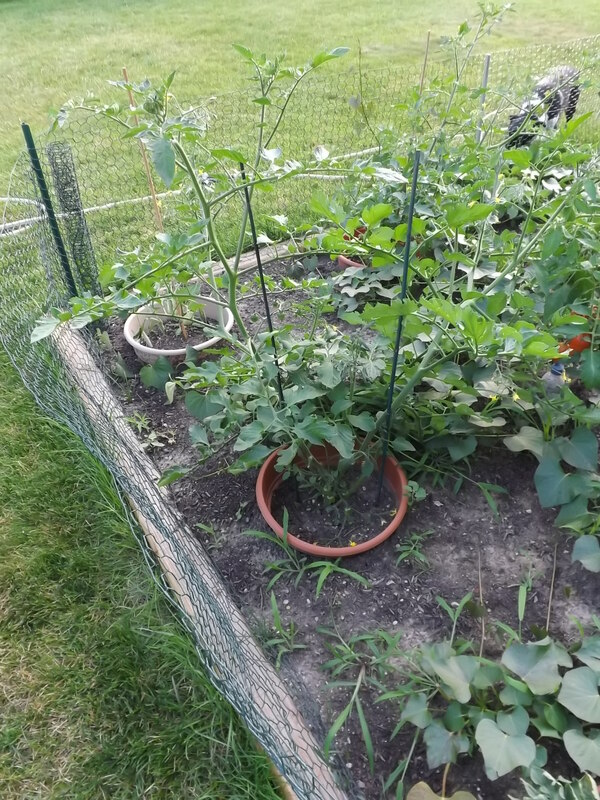 I can actually see the dirt around the tomato plants now, not to mention I found a few plants that had been completely covered by the sweet potato vines that would have been lost forever had I not gotten in there to tame this nearly out-of-control jungle. 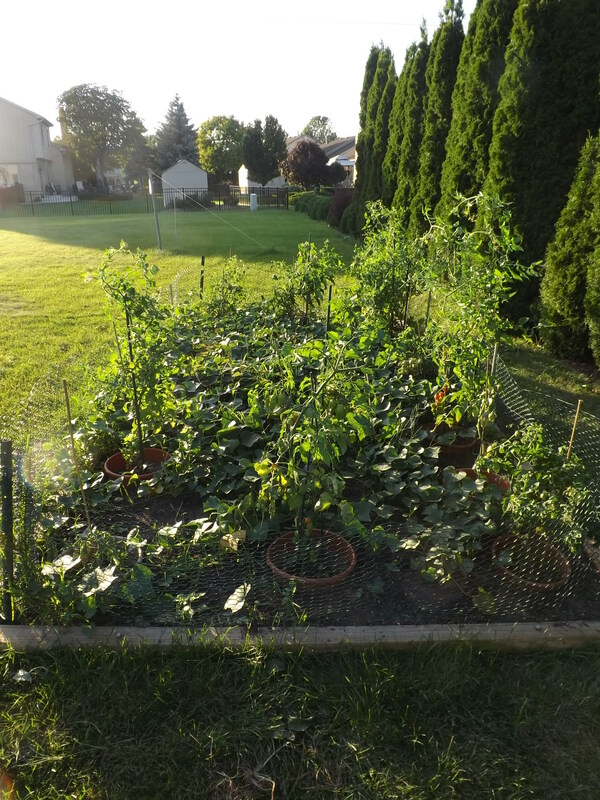 The hot and humid weather was great for the garden and gave it one last boost before the cooler weather of fall begins its reign, and for this I am — Simply Grateful. Although canning season is still in full swing, I am always on the lookout for new ways to use my surplus of canning jars. I say surplus but I never stop looking for good deals on them. 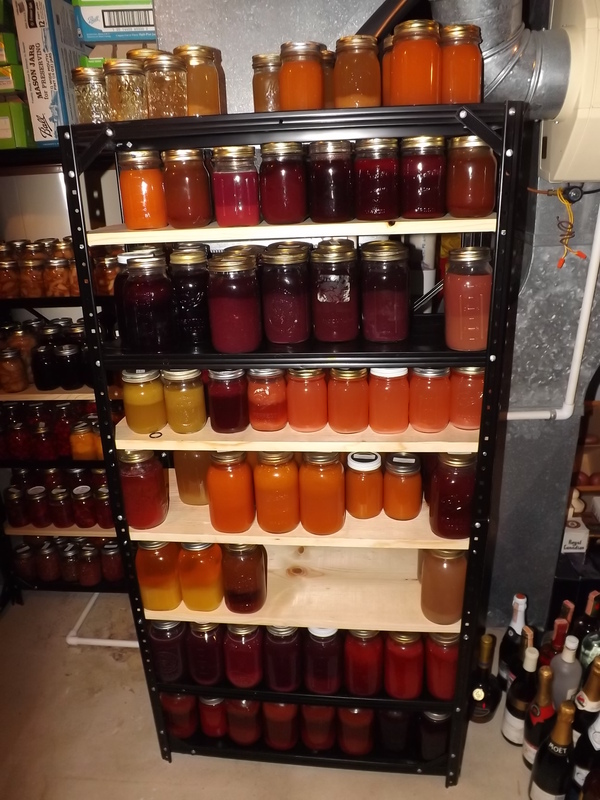 Right now in the garage I have more than 200 jars waiting to be filled. I have them fairly well organized, but have yet to do a count. 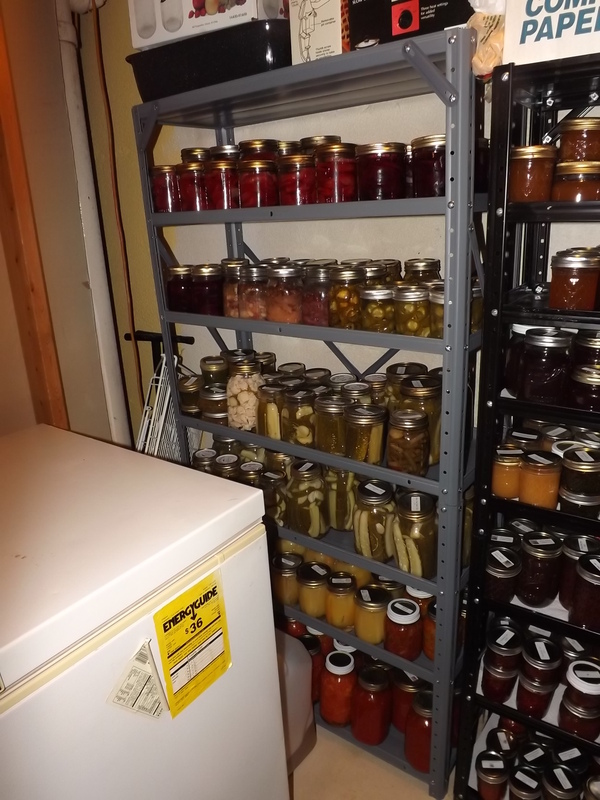 Canning daily makes a count somewhat pointless for the moment, but it is very comforting having so many ready for use whenever the occasion arises. 1. 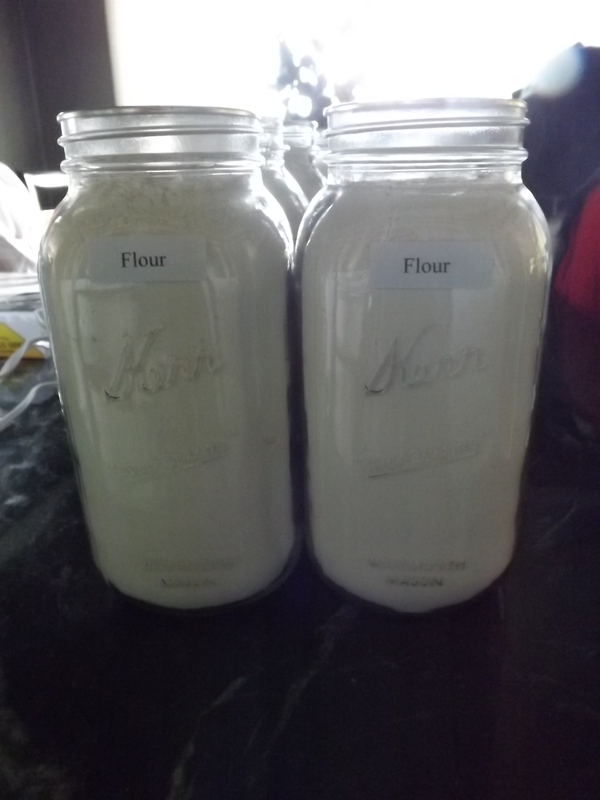 Storing surplus sugar, flour, canning salt, Clear Jel, brown sugar, confectioners sugar, or any other kitchen staple. 2. 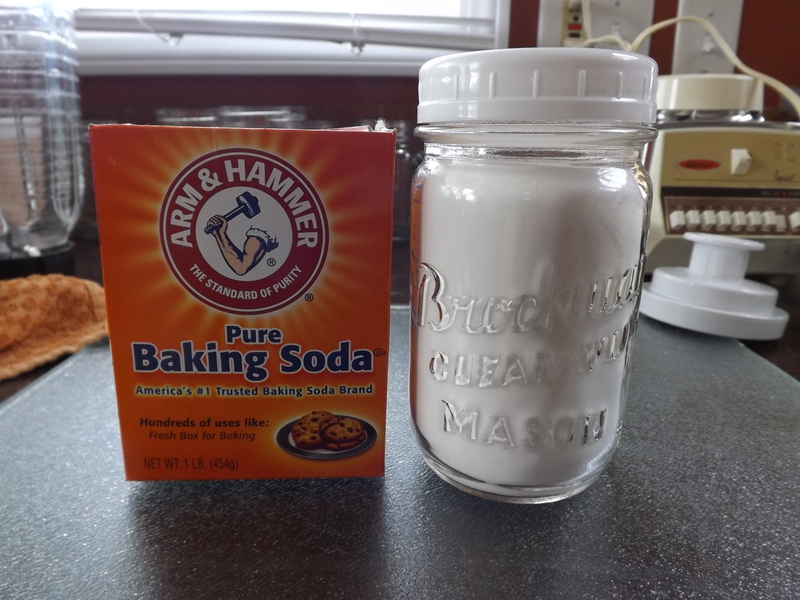 Keeping baking soda in. I don’t know about you but that little box has a tendency to spill and make a mess in the cupboard more often than not. 3. 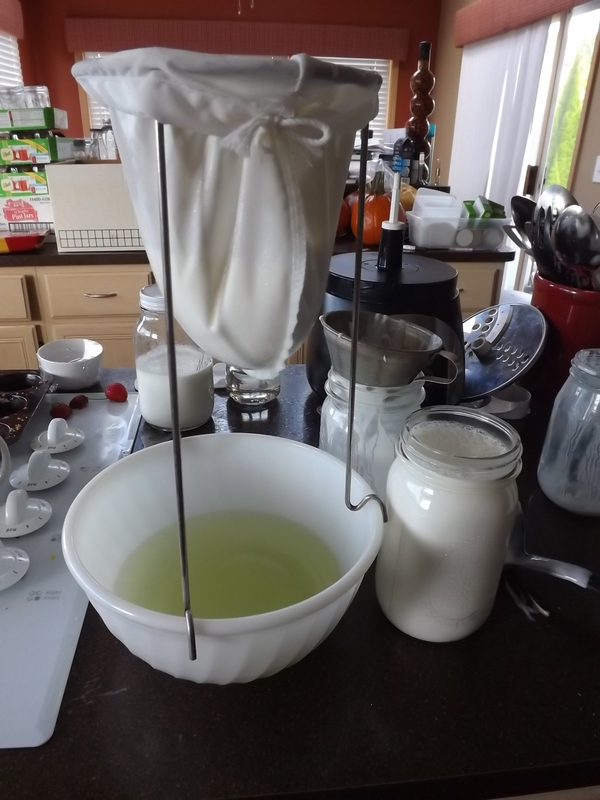 Storing homemade yogurt in. 4. I use one with a pump on it for hand soap on the kitchen counter. 5. Storing cereal in — those boxes are just too cumbersome. 6. Bookends — Yep, I have two 1/2 gallon jars filled with water that serve as bookends on my counter to keep my cookbooks from falling over. 7. Memory Jar – Grace and I both have a jar in our rooms that we put tiny slips of paper that we write special memories on when they happen. At the end of the year we open them up and share them. 8. Bank – I keep one in my laundry room for spare change that I find in everyone’s pockets and the occasional dollar. 9. Dill Keeper – I use a 1/2 gallon jar whenever I buy dill for pickling and need to keep it fresh for a few days. 10. 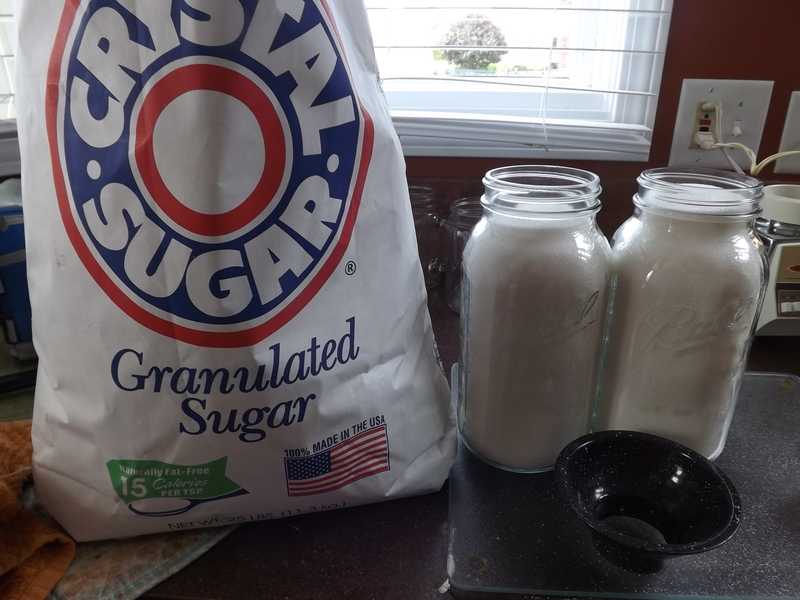 Lard Keeper – I use a mason jar to store bacon grease or lard after making cracklings and store this in the fridge until use. 11. Pen Keeper – I use one on my desk to hold pens, pencils and a pair of scissors. 12. Yogurt Parfait – Grace uses a wide mouth 1/2 pint to make yogurt parfait to take to work with her. 13. Butter Keeper – I use 4 oz. jars to store homemade flavored butters. 14. Workshop Organization – I use mason jars to organize nuts/bolts/screws and nails. 16. Collector’s Storage – Zeb uses a gallon jar to hold his bottle cap collection. 17. Snack Keeper – I store potato chips, pretzels, crackers, nuts, and other salty snacks in jars for storage. Ok, so this isn’t even close to 101, but it is a start. These are ways I use mason jars every day. What do you use them for other than canning? Finding multiple uses for something that I love to see in every room in the house gives me great comfort, and for this I am — Simply Grateful. I know spiders are an important part of our ecosystem, but that doesn’t make me like them in the least. I’m not an arachnophobe, but when spiders wander into our house, out comes the vacuum and bye-bye goes the spider. While checking for more strawberries I happened to notice a wonderful web strung between the arborvitae and the lilac bush. It was unfortunate that the spider was there, but it did make taking pictures of the web easier. 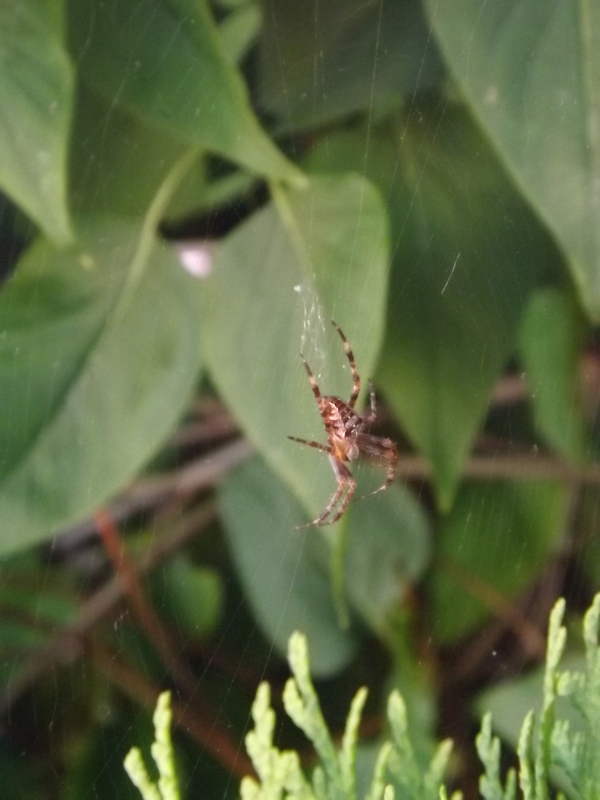 I have never been able to get my camera to focus on the silvery, clear threads of a web. The spider at least made it possible to capture a glimpse of yet another wonder of nature. Even the scariest of God’s creatures have beauty to share, and for this I am — Simply Grateful. After weeks of sitting in boxes and blocking access to the pantry, I finally got Hubby to finish cutting the shelves to expand the metal shelving units to accommodate more jars. I wish I’d thought to take before pictures of the 20+ boxes of canned goods that sat on the floor, but hindsight is always 20/20. The pantry is now organized exactly the way I want it — today. Tomorrow might be a different story, but for now, everything has a place and there is a place for everything. This shelving unit has vegetables: Beets, beans, pickles, peppers, and tomatoes. 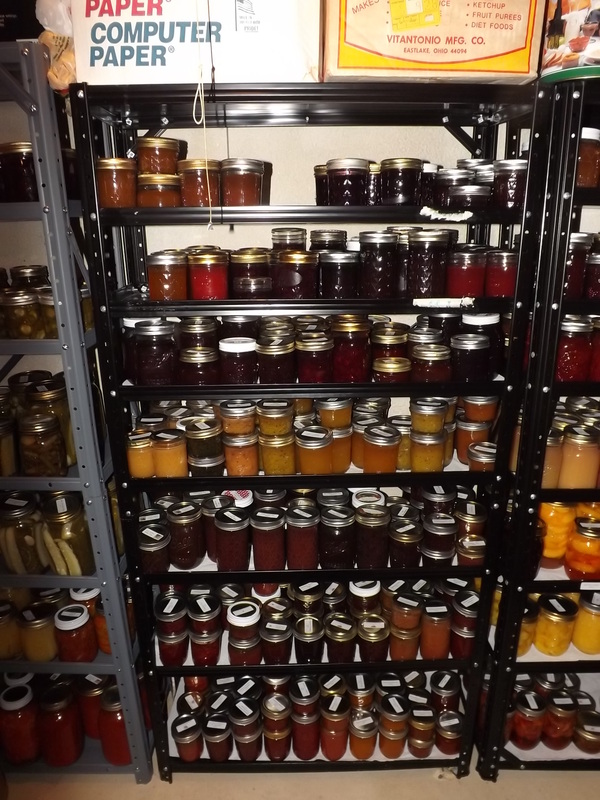 This shelving unit is full of jams, jellies, preserves, and spreads. This shelving unit has all syrups and canned fruit. This unit, which needs another shelf added to the top, has all pie filling. This unit, the only one not full yet, contains juice and concentrates. Can you believe someone was throwing this bin out? 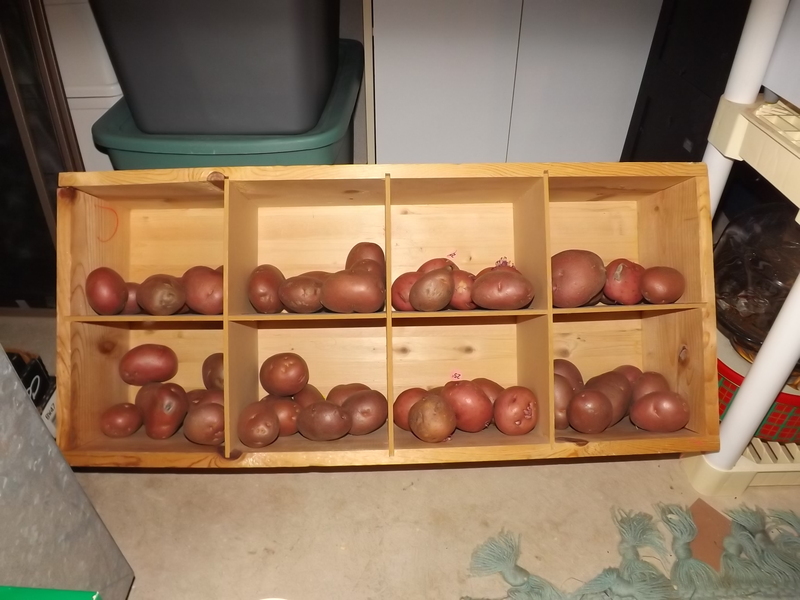 Found it in the garbage a week ago and knew it’d be perfect for my potatoes. These two units hold any store-bought stock as well as home-canned dehydrated food, relishes, sauces for cooking, granola, canned cakes and stewed tomatoes. 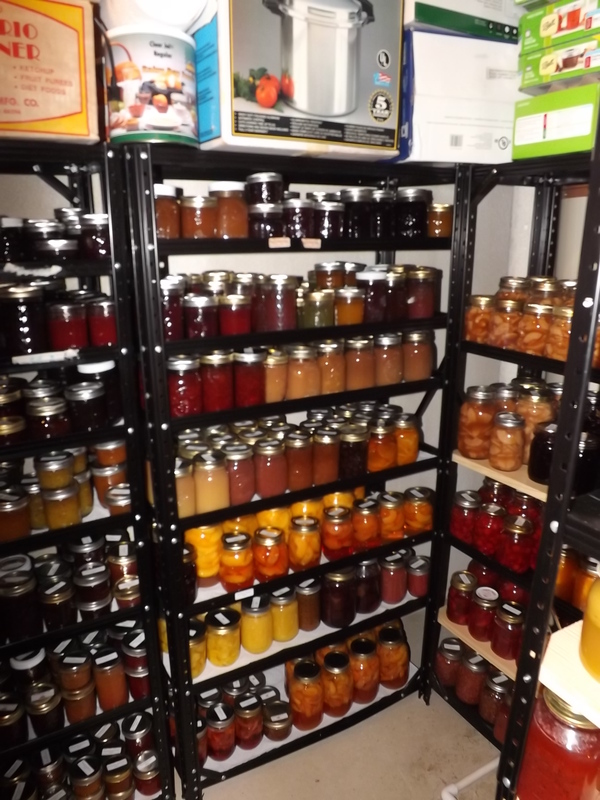 With all the jars organized and put on their respective shelves, it makes using them all that much easier. Today I used home-canned jalapenos, green chili peppers, and cut tomatoes to make some salsa. I found them quickly and easily. Four empty jars to add to the ever accumulating surplus of jars out in the garage. That’s my next project — organize all the jars and make them accessible. 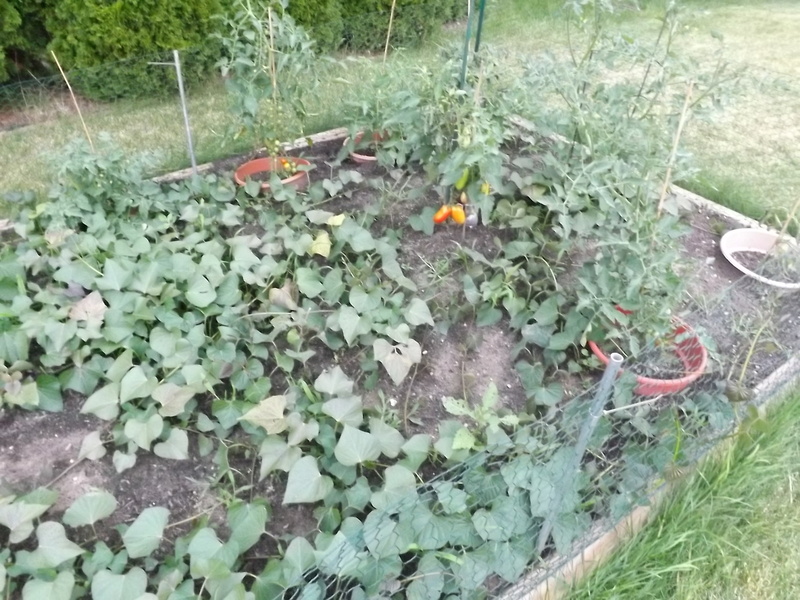 I am still going to need at least one more shelving unit for sweet potatoes, more pickles, more peppers, more tomatoes, pumpkin, and whatever else fall brings. 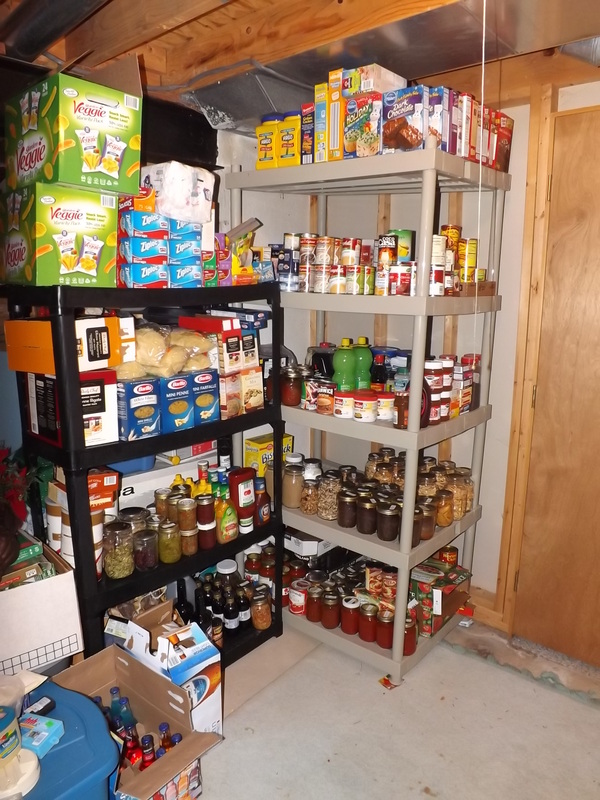 When I find that unit, hopefully in someone’s trash, I’ll no doubt have to reorganize again, but for now, the pantry is up-to-date. Being organized is a great thing. It leaves me feeling accomplished and for this I am — Simply Grateful. One of the easiest fruits to peel, in my opinion are tomatoes. I have never had a problem with the skins holding on, typically they are already cracked and slipping off before they get dropped in the ice water. Still, as easy as they are to peel, when you have a lot of them to do, any work is work. Plus, boiling the water on a humid, summer day does not thrill me in the least nor does the smell of the tomatoes as they are boiled. 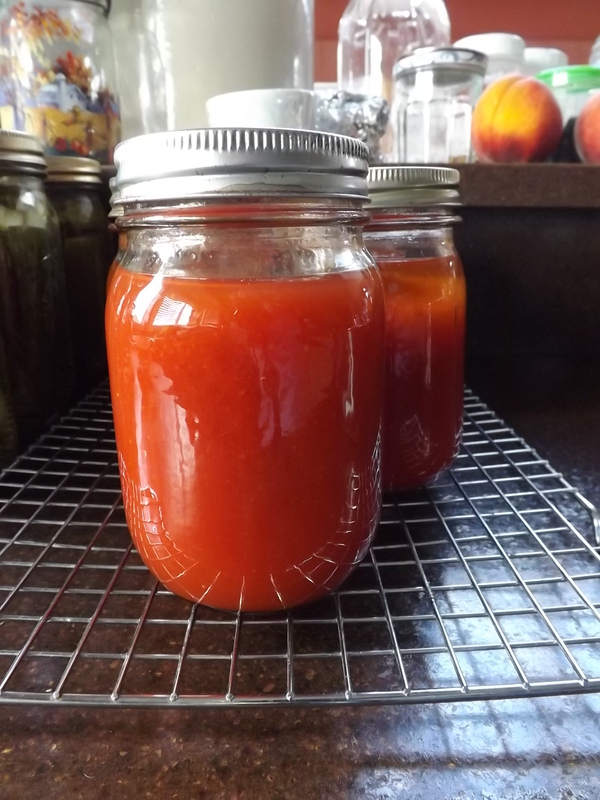 Recently I was preparing some tomatoes for a recipe of stewed tomatoes, I had two quarts that I’d freshly picked and two quarts that I’d tossed in the freezer unpeeled and un-cored as I picked them over the past several weeks. I had already decided I wasn’t going to peel the tomatoes because when I buy stewed tomatoes from the store I puree them and strain them. I do not like whole tomatoes or chunks of anything in my sauces. Peeling the tomatoes when I was going to be straining the sauce prior to canning seemed pointless. 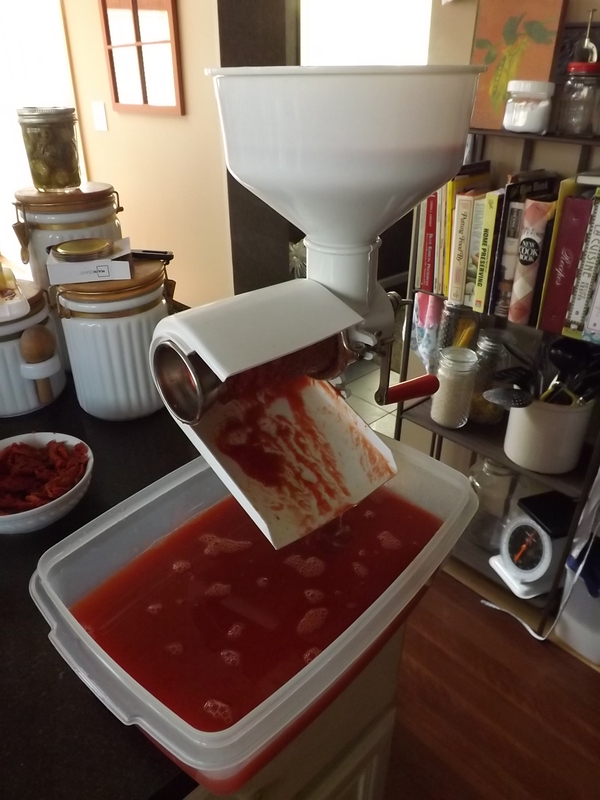 I pureed the 2 quarts of fresh Romas and then pulled the frozen ones from the freezer. Of course, being lazy, or rather ingenious as I discovered, I hadn’t washed the Romas that I froze. So I dumped them into a colander and began to wash them under luke-warm water. As I gently rubbed the hard-as-a-rock tomatoes, the skins slipped right off. No boiling. No hot steam to contend with. No mess. The skins came off perfectly. I was thrilled! 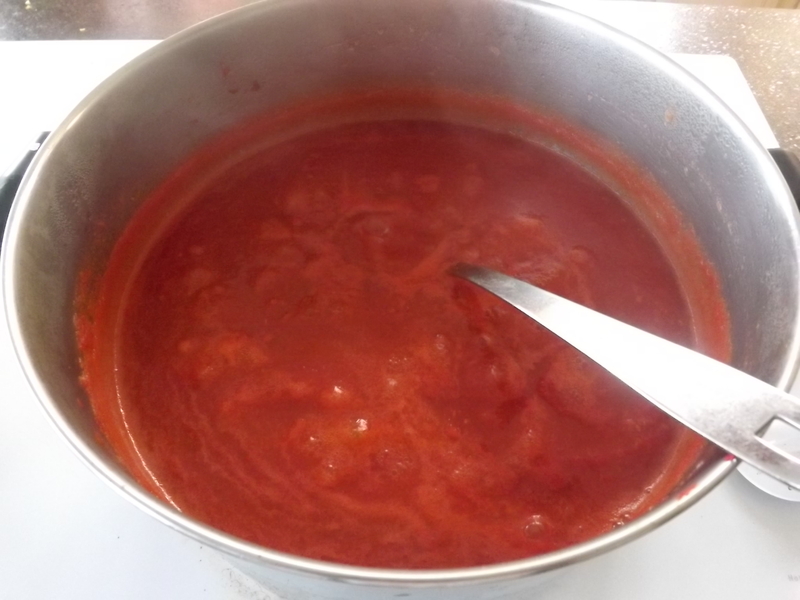 Now, when I go to make tomato sauce or any recipe that calls for tomatoes that don’t necessarily have to keep their shape or form, I am going to freeze them, peel them, and toss them in the pot. For my stewed tomato sauce I didn’t need them skinned, but it was a great trick to learn to use another day. Combine all ingredients in large sauce pan and bring to boil. Reduce heat and simmer for 30 minutes to combine flavors. Use a stick blender to chop any remaining chunks of vegetables and boil 5 minutes more. 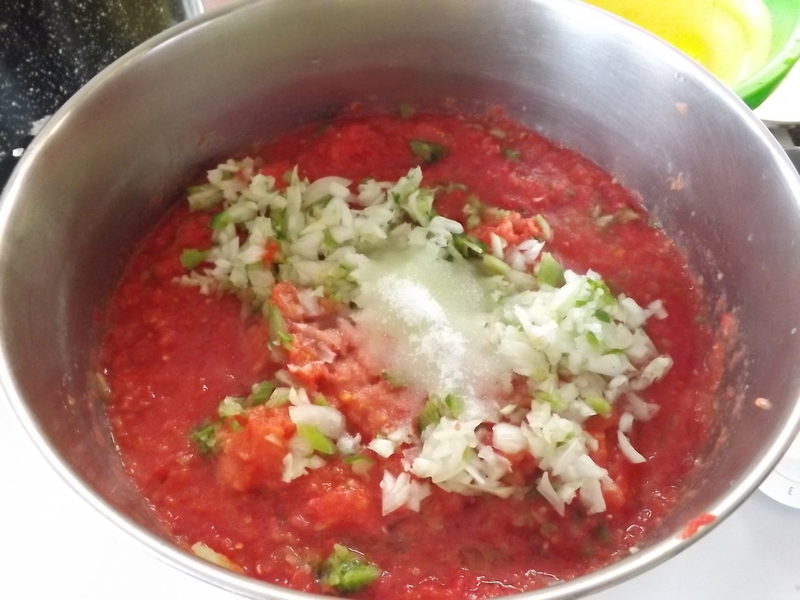 Remove sauce from heat and run through food mill or strainer to remove seeds, skins, or any remaining chunks of vegetable. This is the pulp that came out of the strainer – about 1 cup of packed seeds and skins. Ladle hot liquid into hot jars leaving 1 inch head space. Add 1 Tbsp. of lemon juice to each pint or 2 Tbsp. to each quart. Cover and place in pressure canner. 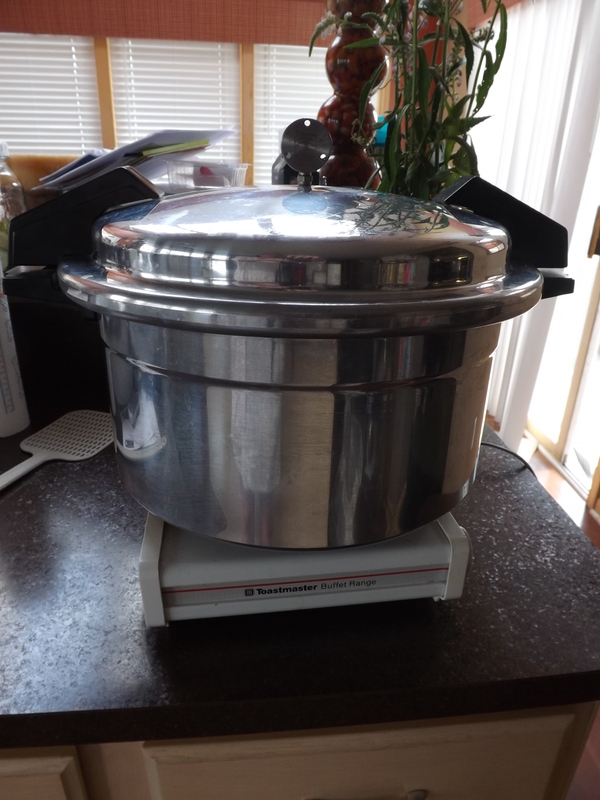 Adjust water level, lock lid and bring to a boil over medium-high heat. Vent steam for 10 minutes, then close vent. Continue heating to achieve 10 pounds of pressure. Process pints for 15 minutes and quarts for 20 minutes. Turn off heat. Allow to cool completely before opening canner. Canning is a learning process every time I do it. No matter how often I make certain recipes, there always seems to be something new to chalk up to experience. Finding a new method to skin tomatoes happened by accident, but I’ll take it, and for this I am — Simply Grateful. Can You Guess What’s Under The Paper? 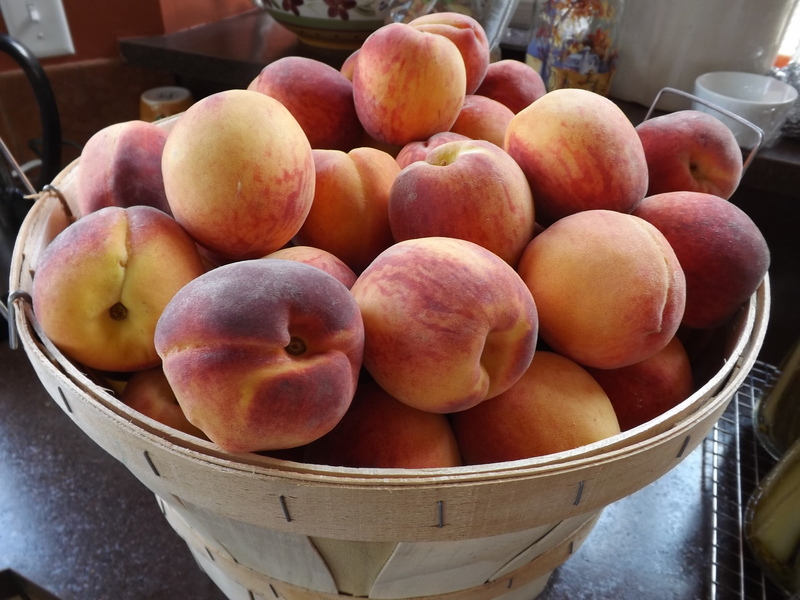 Last weekend while Grace and I enjoyed a morning of farmer’s market shopping, we found Michigan Red Haven peaches. These are by far the best peaches for canning, cooking, and eating that I have found. They are free-stone, peel easily, and taste sweet and fresh. 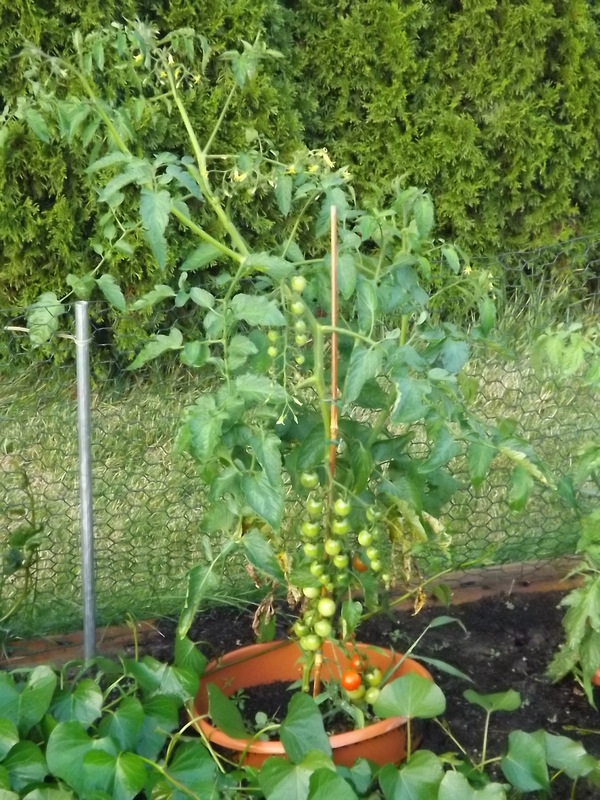 Still, a half bushel of these fresh from the market tend to be hard and in need of more ripening. I admit that I am not a patient person. I have been guilty of trying to can peaches way too early, before they’ve ripened, and end up with a mess. They don’t peel and no matter how much they claim they are free-stone, unless that peach is ripe, it isn’t free-stone. Just about two weeks ago I rushed some seconds I bought at another farmer’s market and ended up using most of them to make Peach-Lemonade Concentrate because peeling them was impossible. I was happy with the resulting concentrate, but frustrated nonetheless that my impatience got the best of me. When you lose — don’t lose the lesson! So, learning from my mistake, this time I forced myself to wait. But keeping the peaches in the bushel basket would make some of the peaches rot, some of them ripen, and leave many of them hard as a rock. So I needed some knowledge on the best way to ripen peaches evenly and quickly — again, remember I’m not a patient person. Several web sites suggested placing the peaches on linen, covering them with more linen, and in a few days, Viola! ripe peaches. I don’t have anything linen in my house. I’m just not that type of girl. So the search continued. Finally, after a few more pages of results I came across an article that dealt with ripening peaches myths. The one that caught my eye was about placing a peach in a paper bag, closing it and then in a day or two you’d have a ripe peach. The article stated that typically what happens when you close that bag is that moisture builds up and you end up with a rotten peach or one that is way too soft. The remedy, place the peach on flattened out paper bags and cover with more paper bags, leaving the sides open so the peaches can breathe. Okay, this was something I could work with. 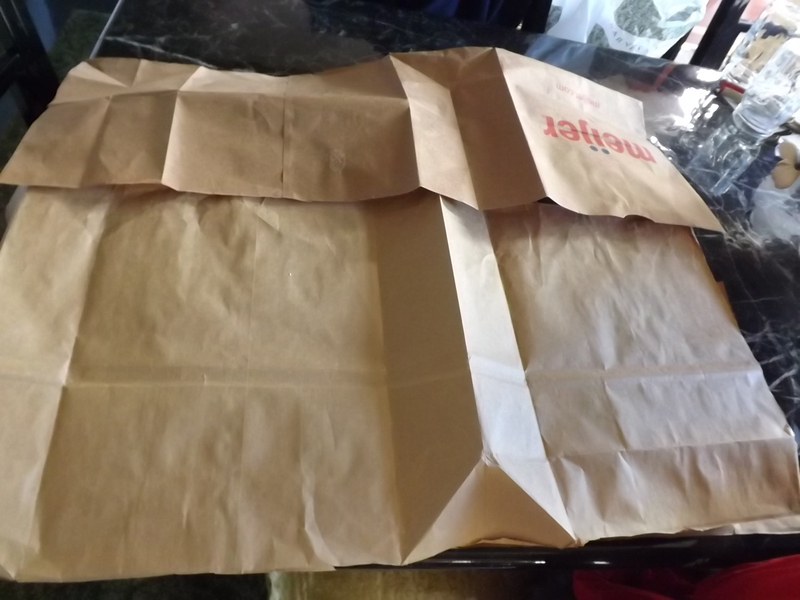 I always like to pick up a few paper bags when I’m at the grocery store, just for such an emergency, and the dining room table was screaming for some use. 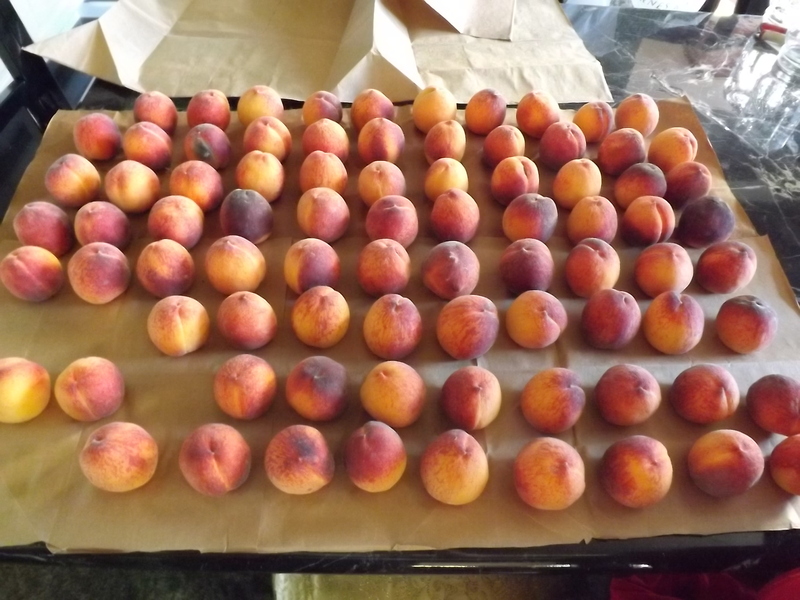 I cut two paper bags and laid them flat on the table, spread out the half bushel of peaches, and then cut two more bags to cover them. I let them sit there for three days. Day 1: You’d never know what was under that paper if you didn’t sneak a peek. Day 2: There was a faint scent of peach if you happened to pass by the table in a rush and a slight breeze wafted through the room. Day 3: The house was overtaken by the smell of fresh peaches. That’s when I knew they were ready. Of course Hubby and the kids stole a few from under the paper, as I found out when I removed it this morning, but at least I knew they were good and sweet and ready for canning. It took me about 3 1/2 hours to peel, pit, can and process this half bushel, yielding me 10 quarts of fresh packed peaches for the winter. 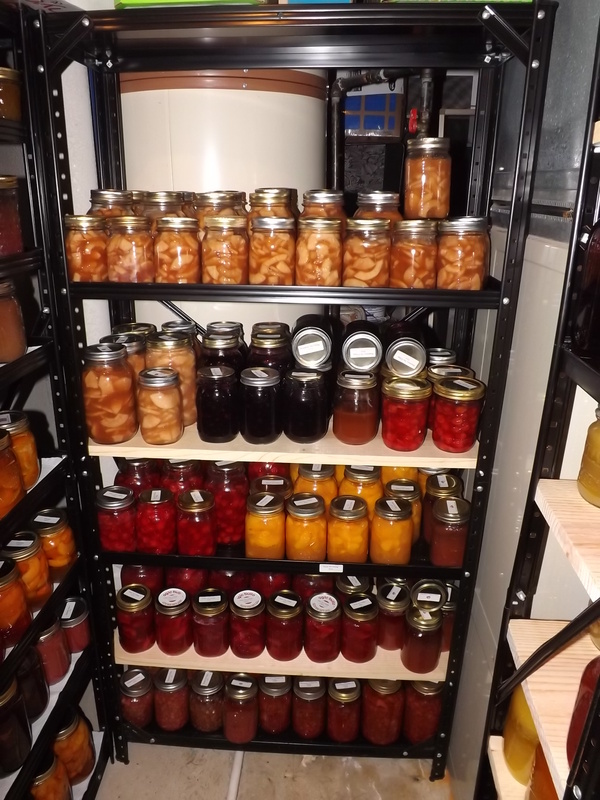 Every peach peeled easily, every peach pitted without a fuss, and every peach was perfectly ripened for canning. One of our favorite sayings around here is: Thank goodness for the Internet! and for this I am — Simply Grateful.